When Moses approached the burning bush, in Exodus 3, the Lord spoke to him and said, "Take off your sandals, for the place where you are standing is holy ground" (v. 5). Moses found himself in the powerful, purposeful presence of God. On that day he began to walk barefoot. 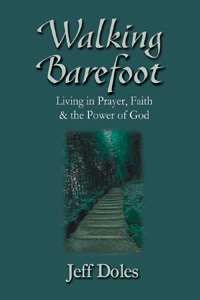 Walking Barefoot is about learning to recognize and respond to God’s presence in our lives. Like Moses, we must realize that God’s presence is holy — He’ll not have us separated from Him by any of our human contrivances. Its about an ongoing relationship, learning to love God deeply, trusting Him more and more, partnering with Him in the world, flowing in His power to fulfill His purposes.